Fan Dilution Systems | Pak Plant Ltd. Fan dilution systems were originally developed in order to discharge the flue products from gas fired appliances at a CO2 level of 1% or less. In the past, fan diluted flue systems have only been considered as a last resort when conventional means of exhausting waste gas products have been discounted. 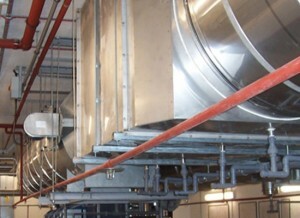 We are able to help specify the correct type of fan, determine its functionality, relative positioning, systems resistance and the noise criteria that needs to be applied during its specification. This enables us to meet the design specification requirements of most architects and designers, as well as ensuring that the visual appearance of the fan fits in with any external building facade requirements.